The Dodgers finally got some timely hits with runners in scoring position and some efficient and effective pitching from starter Ross Stripling to snap their six-game losing streak and avoid back-to-back series sweeps on Sunday at Dodger Stadium. Jhoulys Chacin struggled after getting the first two outs in the bottom of the first, and the Dodgers’ offense took advantage. 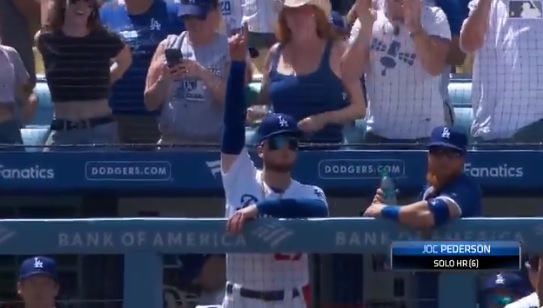 Alex Verdugo didn’t bite at Chacin’s pitches on the outside corners with the bases loaded, and his two-out two-run single gave the Dodgers an early lead. Joc Pederson, who barely missed hitting a home run in the first, smacked a solo home run with two outs in the second off Chacin. Pederson now has six homers, three behind NL home run leader Cody Bellinger. The L.A. offense kept piling it on. They scored another three runs in the third on an RBI single from Max Muncy and a two-run single from Chris Taylor, chasing … wait for it … Chacin from the game after 2.1 innings. Verdugo crushed a Chase Anderson changeup in the fifth for his third homer of the season, increasing the Dodgers’ lead to 7-0. Someone wants an everyday job. Stripling gave the Dodgers just what they needed with 8 innings of one-run ball on 88 pitches (59 strikes). He didn’t strike out his first batters until the sixth, but he only allowed one walk and four hits with a lot of weak contact. Stripling is the first Dodger starter to pitch into the 8th inning, this season. The Brewers finally got on the board in the eighth on a Eric Thames sac fly. The Dodgers threatened again with the bases loaded and two outs in the bottom of the eighth vs. Milwaukee reliever Jake Petricka, but Pollock lined out to center to send the game to the ninth and the Dodgers’ bullpen. Jaime Schultz got the ball in the top of the ninth, his second relief appearance in as many days. Schultz walked leadoff Hernan Perez, but retired the next three Milwaukee batters in order to complete the Dodger victory. The Dodgers improve to 9-8 on the season, but remain in second place in the NL West behind the San Diego Padres. Tomorrow we celebrate Jackie Robinson Day. The Dodgers host the Cincinnati Reds for a three-game series, and they’ll welcome back a slew of old friends including the Wild Horse himself. Yasiel Puig will face Clayton Kershaw as the Dodgers’ ace makes his first start of the season. Right-hander Luis Castillo (1-1, 0.92 ERA, 1.98 FIP) takes the mound for the Reds. First pitch is at 7:10 PM PST.